and/or Traveline SouthWest Mobile App. The Timetables and information found on this page are to our knowledge current and provided in good faith however, it's best to check with the service providers in advance before depending on them for your travel plans. If this timetable does not fit your school/work/leisure life routine or needs, please see other services below and then also complain to Citistar (was Crosville) and North Somerset Council and Parish Council. 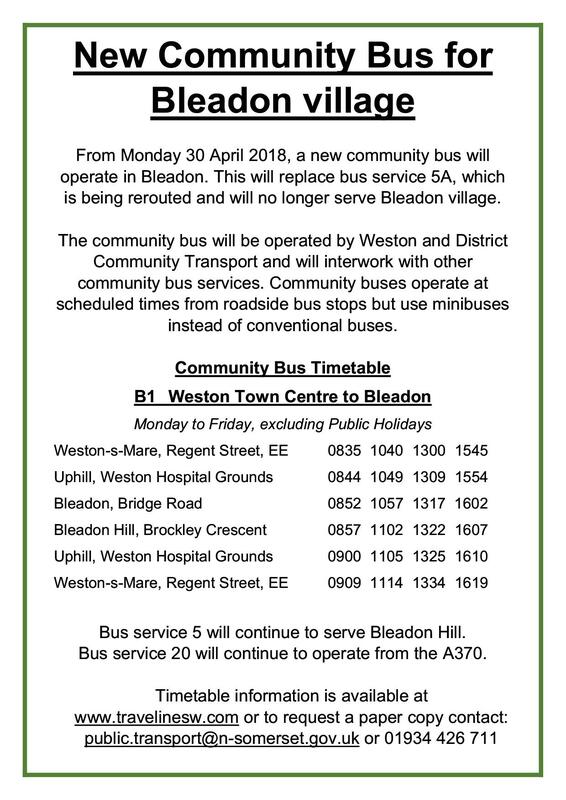 Other buses passing near Bleadon Village (5-10 minute walk to/from village stops on the A370) include the Number 20 'Coast' Service (PDF copy as at 16 Jan 2019) NB: Last buses from WSM are 1800ish, including WSM Town Service(s) Number 5 Bleadon Hill (Brockley Crescent/Burnham Drive), then at least 15-20 minute walk to village. However, the Number 7 is a much later service from WSM but only to Oldmixon area (Loxton Road/Brompton Road), then it's either a 30+ minute walk up/down a steep hill (with few lights, pavements) or via busy main road (A370) with no street lights and overgrown hedgerows!! To double check current timetables use Traveline links above or see First Group here for their Journey Planner. National Rail nearest station is Weston-super-Mare. ROAD** The A370 passes through Bleadon. Pan & Zoom to see more. Click symbols for detail. Use Menu and 'Customise my map' to show or hide 'Data Layers' for personal interest. Map provided by Google and Data via Elgin and may take a few seconds to load. **Please note that Traffic data from Frixo below may not currently display via HTTPS so your browser security settings may give you a warning, you can choose to ignore the warning and the data will then display. BOB is in contact with data suppliers to resolve this issue ASAP**.